Alex Laurence "Larry" Spinelli was born Alessandro Lorenzo Spinelli on September 19, 1892 in Vicksburg, Mississippi. His father, Alessandro Pasquale Spinelli, was born 1860 in New Orleans, Louisiana, of Italian and Scottish ancestry. His mother, Maria Spinelli, was born 1864 in Vicksburg Mississippi. His parents married in 1886 and had three children. His older sister Beatrice was born 1889 and his older brother Guiseppi was born in 1890. His father was a conductor and clerk for the railroad. In 1895 when he was three years old his mother died in Vicksburg from complications following the failed delivery of her fourth child. Two years later on June 4, 1897 his father married his second wife, Maria Valls, who was born 1851 in Louisiana of Spanish ancestry. They had no children of their own. They moved to New Orleans, LA, and lived at 929 Robin Street, where the children were raised. On August 15, 1911 his stepmother died in New Orleans at the age of sixty. Around the same time, while he was still a teenager, hospital records indicate Laurence Spinelli's left leg was amputated above the knee. The reason for this is not known, however severe accidents were not uncommon in 1911 New Orleans, which was a busy industrial port with narrow streets crowded with wagons, carts, street cars, and railroads. In 1915 at the age of twenty-three he moved to New York City and lived at 400 West 57th Street. He studied drawing with George Bridgman (1865-1943) at the Art Students League of New York, which was close by at 215 West 57th Street. By 1916 he began to work in NYC as a self-employed freelance commercial artist. On June 5, 1917 he reported for draft registration during the Great War. He was recorded at the time to be five-eight, medium build, with light brown eyes and brown hair. He was exempt from military service due to his physical handicap. On January 22, 1921 he married Katherine Shepard in Manhattan. She was born 1892 in New York City. Her parents were both German immigrants. They moved to Long island, where they lived at 545 Eagle Avenue in the Lake View section of West Hempstead, New York. 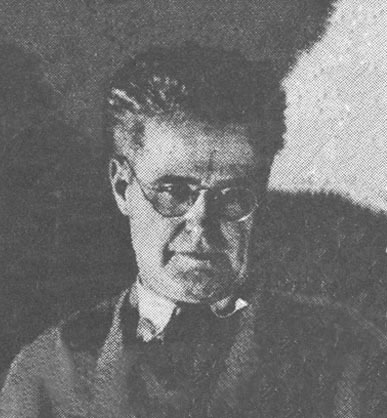 During the 1920s he worked in NYC as a pen-and-ink artist in the advertising field, where he met Adolphe Barreaux, who worked in managerial positions for several advertising agencies at that time. In 1925 he opened an art studio at 247 Park Avenue, near 32nd Street, in Midtown Manhattan. 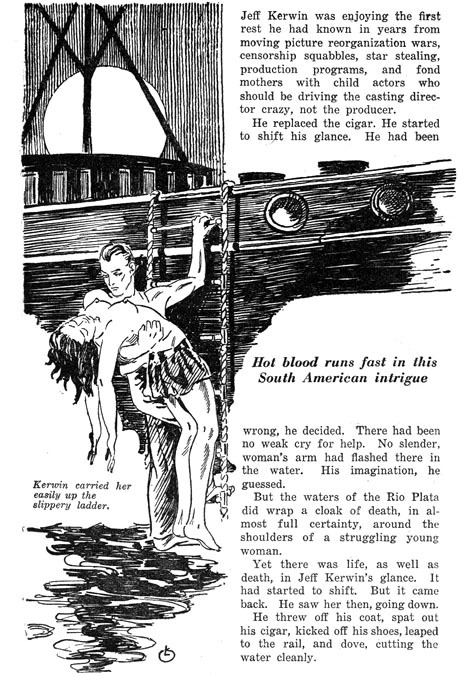 He placed a listing in a nationwide business directory for advertising artists and technicians, in which he itemized his services as including figural work, black and white, color, drybrush and line drawings. 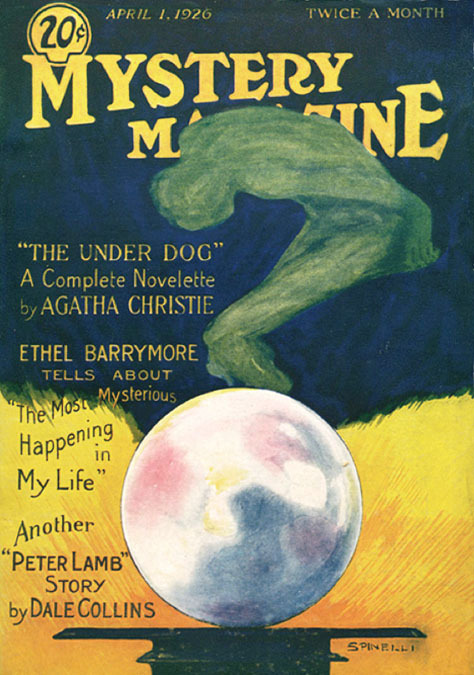 In 1926 he painted the cover for Mystery Magazine. 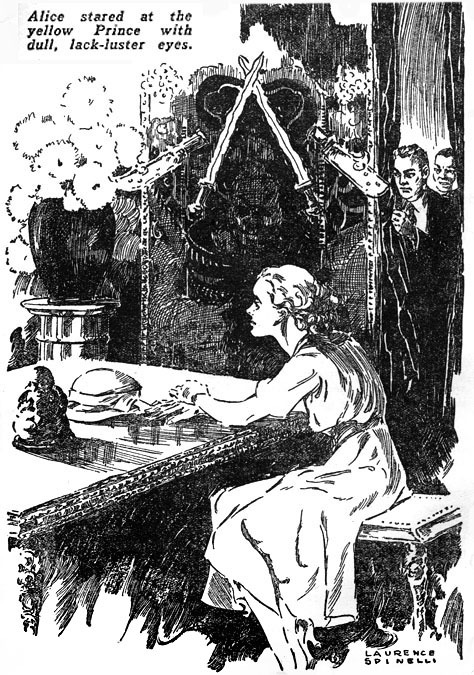 During the 1930s he worked for Harry Donenfeld's pulp magazines under the art direction of Adolphe Barreaux. 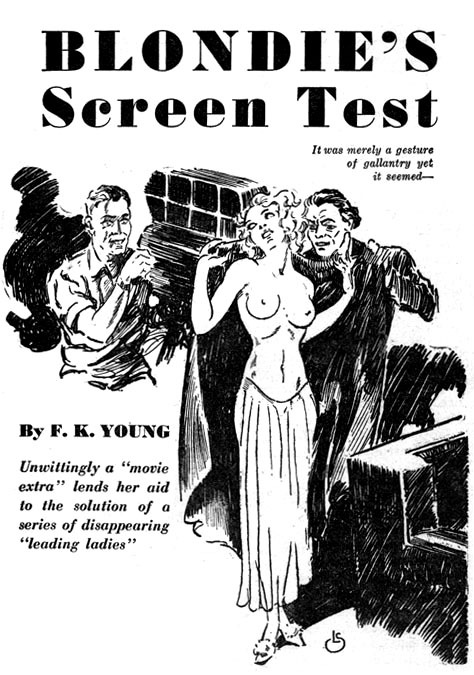 His work appeared in Saucy Stories, Mystery Adventure, New Mystery Adventure, Saucy Movie Tales, and Snappy Stories. 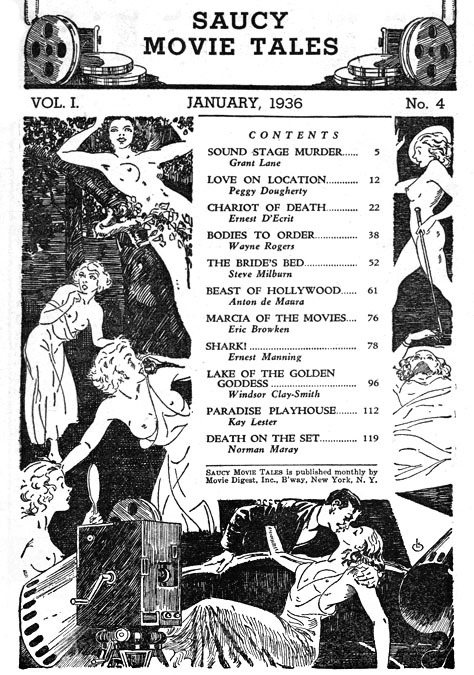 He designed the decorative border that frequently appeared on the contents page of Saucy Movie Tales. He signed most of his work with a distinctive motif composed of his initials "LS." 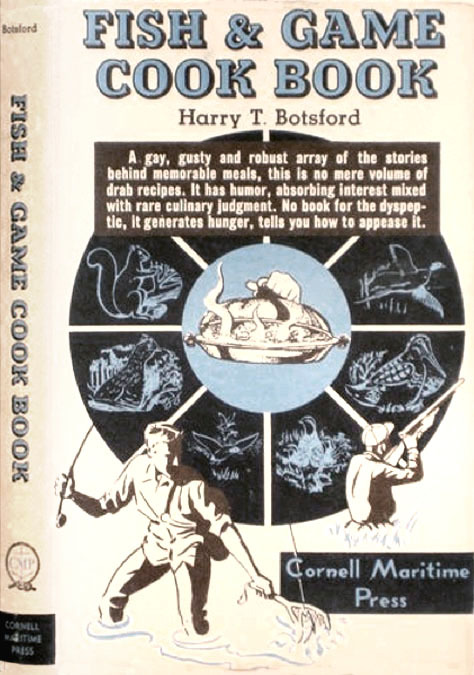 In 1947 he illustrated Fish & Game Cook Book by Harry Botsford for Cornell Maritime Press. 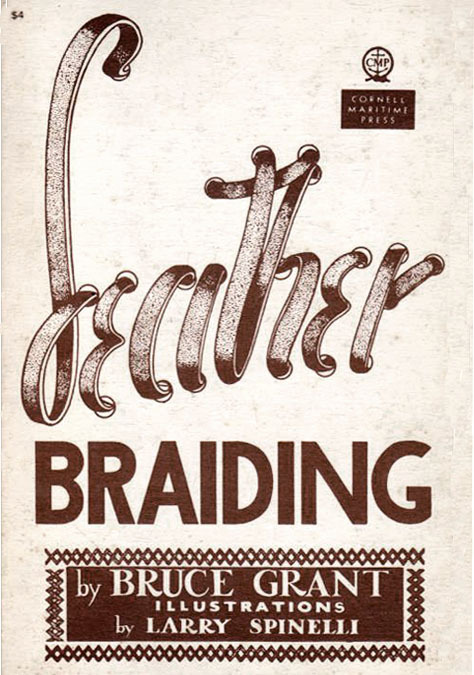 In 1950 he also illustrated Leather Braiding by Bruce Grant for the same company. According to The Union Bulletin of Walla Walla, Washington, this was "the first comprehensive book on the subject to ever be published." Larry Spinelli died in West Hempstead, NY, at the age of ninety-one on December 1, 1983.